Welcome to another weekly fashion post, where I share real fashion for real women. Each week, I highlight at least one outfit that I'm wearing right now, as well as provide ideas and inspiration to help you get dressed in the mornings. Life is hard, getting dressed shouldn't be.This week lets' discuss a trend for spring: floral pattern. If you've been out doing any spring shopping, you've probably seen vibrant floral patterns on everything from shirts to shoes. And these are not your grandmother's flower prints. Today's floral prints are rich in color and design, and can really bring interest to basic pieces. 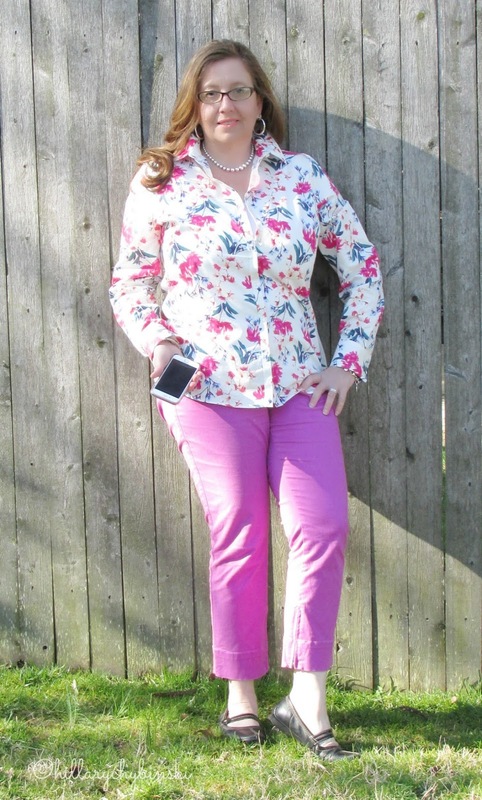 My mom got me a great floral shirt from Lands End for my birthday, and I finally gave a wear. The colors are so bright, on a basic background of white. The style of the shirt is a simple, basic button-down. Both the background color and the simple structure make this the perfect impact piece. Paired with a pair of jeans for a casual look or with an a-line skirt for a dressed up look, it's a pretty versatile piece for a pattern. 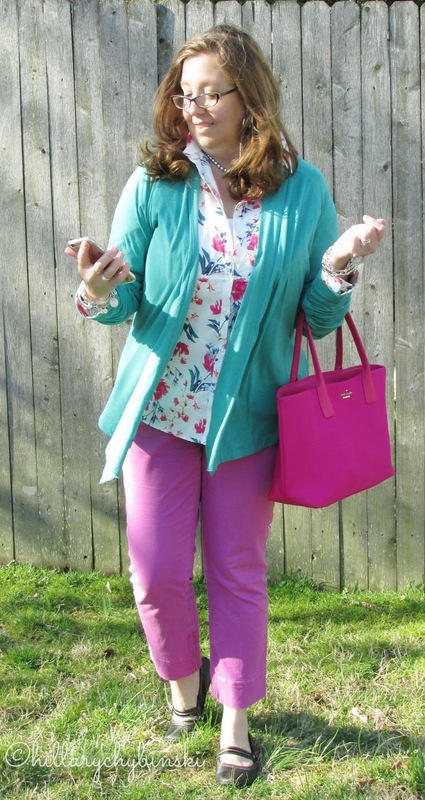 I paired it with a very old pair of radiant orchid cropped pants that I had hanging in my closet. I kept everything else simple, adding my favorite Brienne Tank from Aventura as a base layer and simple black flats. I did add one more flash of color with this bright Kyle Wrap from Aventura as well. It was chilly, so I needed a jacket. How else can you wear the new floral trends? Put on a great pair of floral shoes with your favorite jeans and t-shirt. A floral skirt always looks great paired with a classic twin set. Break up a pretty floral dress with a solid colored cardigan or jacket. A floral cardigan can brighten up a simple white shirt and jeans. Are you a fan of floral? How are you wearing it this season? This post isl inked up at The Pleated Poppy - be sure to check it out for even more outfit ideas and inspiration. Nope, nope, nope. I can't do any sort of floral on my body EVER. Maybe one day, I'll put a flower in my hair. I think I'm still traumatized from some floral clothes I had in the 80s! I just bought a boho type floral shirt that I've been wearing all the time. Never did I think you'd catch me in floral. Like, EVER. I love floral but it has to be just right. I have this JCrew number that I LOVE!